Accept new definitions for theory, normative theory, and descriptive theory. Also, modify the definition of methodology to reflect these changes. The modification was suggested to Scientonomy community by Zoe Sebastien on 23 January 2017.1 This modification is incompatible with Sciento-2016-0002. The modification was accepted on 15 February 2017. Currently, theory is defined as "a set of propositions that attempts to describe something". This definition implies that all theories are necessarily descriptive and excludes the possibility of normative theories (such as those of ethics or methodology). This makes it impossible to even formulate the question about the status of normative theories in the mosaic, let alone have a meaningful discussion on their status. 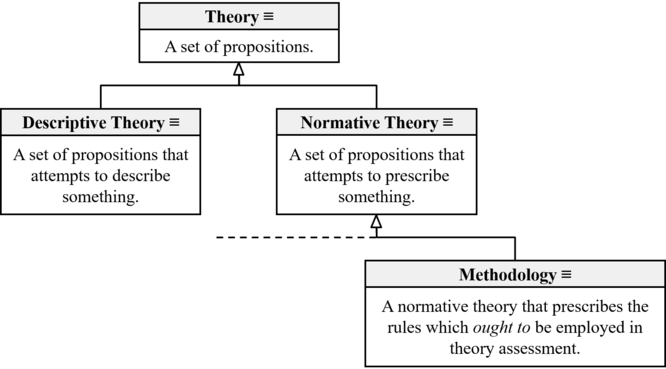 Thus, we need a new taxonomy for theory, descriptive theory, and normative theory so that we can pose a meaningful question on the status of normative propositions in the mosaic.